Zirc (German: Zirtz) is located amidst the Bakony Woods, a hilly landscape in central Hungary approximately one hour from Vesprém. After the Ottoman occupation, the city was almost completely depopulated. The Cistercian Order, which had founded an abbey in in 1182, brought famers and craftsmen from Prussia to Hungary in the 18th century. A contract of settlement for Zirc was signed in 1718. The registers show that the German migrants came from different villages such as Hitzingen, Landshut or Linz. The inhabitants had different vocational skills and were builders, craftsmen or field hands. Thus, the community of Zirc in the first half of the 18th century was diverse both in professions as well as in dialects. However, joint traditions soon emerged. The craftsmen’s good reputation was not only well known in Transdanubia, but in the bordering countries as well. One prime representative of the carpenter’s trade in Zirc was the family of Wilde. They had come to Zirc in 1784 and their name is connected with masterly intarsia and the beautiful furniture of Zirc Abbey’s library until today. The Abbey church of Zirc is worth seeing and displays an altarpiece of Mary’s ascension. The library of the Cistercian Order in the Abbey building is listed as a protected monument. 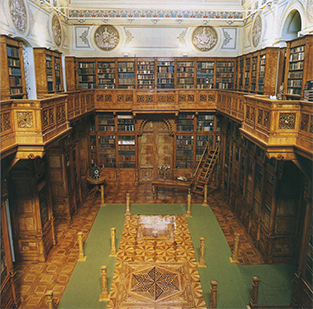 It contains more than 60.000 books, among them treasures like codices from the middle ages. The same building holds a museum of natural sciences, which presents the formation of the Bakony Woods. Library of the Cistercian Order.